When I walk around our town and feel the inner and outer qualities of the past and our dreams for the future I think about the prospects of bringing new people to Blaine to share our distinctiveness. Elsewhere there is a definite new art form being developed to efficiently and economically bring people into their city's core. As gasoline prices and air fares soar travelers are searching for alternative modes that are an affordable, comfortable and efficient means to reach their destinations. Buses and trains have long since been favorite alternatives to both commuters and communities alike. Bellingham and Mount Vernon have created train depot and bus station combinations to establish a transportation center to focus long distance travelers entry to the city. Furthermore taxi stands and seasonal bicycle and skate rental stores are easily accessible to the now walking visitor. 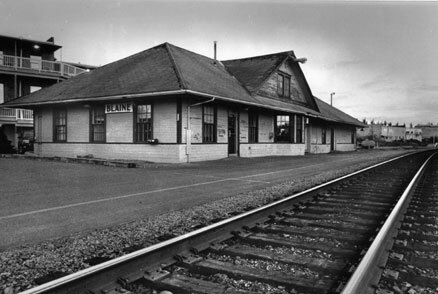 Straightaway we see that the first priority for The Peace Arch City must be to research and establish a railway contract and then develop our own infrastructure that includes an Amtrak passenger station for both north and south bound passengers...in order to keep our business goals "on track."